The rich smooth taste of golden creamy caramel, balanced perfectly to create irresistibly dreamy beverages. Unwrap this caramel from way before yesterday! Free Shipping: On orders over $75.00. Unwrap..... this caramel flavor from way before yesterday! 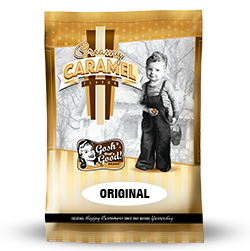 Our Creamy Caramel has a much fuller flavor than any syrup or sauce and has no preservatives. This rich smooth taste of golden caramel is balanced perfectly to create irresistibly dreamy hot, iced, blended or smoothie beverages. Easy to use, shelf stable and so delicious you will never go back! Great on their own for a rich full-flavored beverage. Or combine our Deluxe Flavorings & Mixes with fruits, juices, espresso, coffee, and other flavors to make an unlimited number of specialty beverages. Be creative to offer your own signature beverages unique to your coffee house. Great for making hot, cold, iced, blended, or smoothie beverages. Not a pre-mix beverage. But an ingredient used in making many different coffee house beverages. No need to stock multiple beverages mixes or syrups. Combine with other flavorings to create many different beverages. Easy to measure portions for different drink sizes. 1 scoop = 8 oz drink. 2 scoops = 12 oz. drink. 3 scoops = 16 oz. drink. 4 scoops = 20 oz. drink. 1 scoop = 15 cc or 1 tbsp. Simple to store, no refrigeration needed. You can combine our Deluxe Flavourings & Mixes with fruits, juices, espresso or other flavors to make unlimited specailty beverages. Be creative to offer your own siganature beverages unique to your coffee house. But we also have many drink recipes, just ask! Add 2 scoops of Creamy Caramel™ into 12 oz. cup. Add espresso shots if desired. Stir in steamed milk or milk alternative. Try our Baristir™. Add 2 scoops of Creamy Caramel™ into a mixing colander. Add espresso shots or 2 oz. of hot water. Stir until mixed thoroughly. Try our Baristir™. Stir in 4-6 oz. of cold milk or milk alternative. Add 3-4 oz. of ice to colander. Pour into 12 oz cup, top with whipped cream if desired. Add 3 scoops of Creamy Caramel™ into blender. Add 2 scoops of Gosh That's Good!™ Amaze-O-Mix Blender Base into blender. Add espresso shots into blender if desired. Add 5-6 oz. of milk or milk alternative. Add 8-10 oz. of ice and blend until smooth. Pour into 16 oz. cup, top with whipped cream if desired. Need a Energry Boost? Add our Bev Buz Energry Mix-In to make any beverage an Energry Drink! 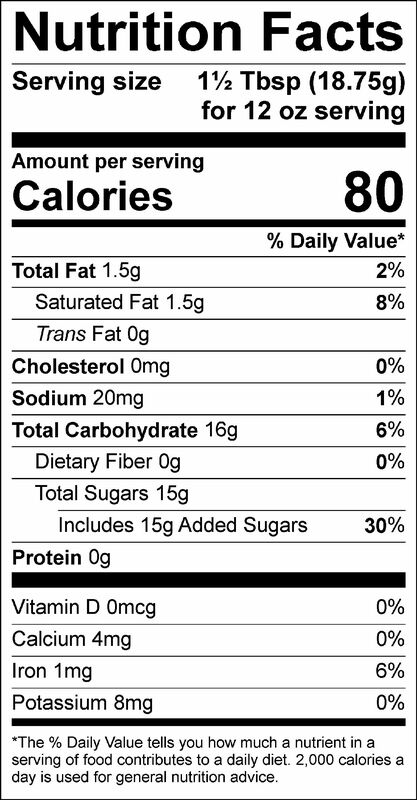 Sugar, non-dairy creamer [coconut oil, maltodextrin, sodium caseinate (a milk derivative), mono-and diglycerides, dipotassium phosphate, silicon dioxide, soy lecithin], natural and artificial flavors, cellulose gum, tri calcium phosphate (anti-caking agent), salt, caramel color. The price of this product varies with the quantity of products ordered in the category "Flavorings & Mixes"